We get our spigariello seeds from “Seeds from Italy,” a great little company that imports Franchi brand and other Italian seeds for sale in the US. They’re also the source for many of our favorite chicories and beans. 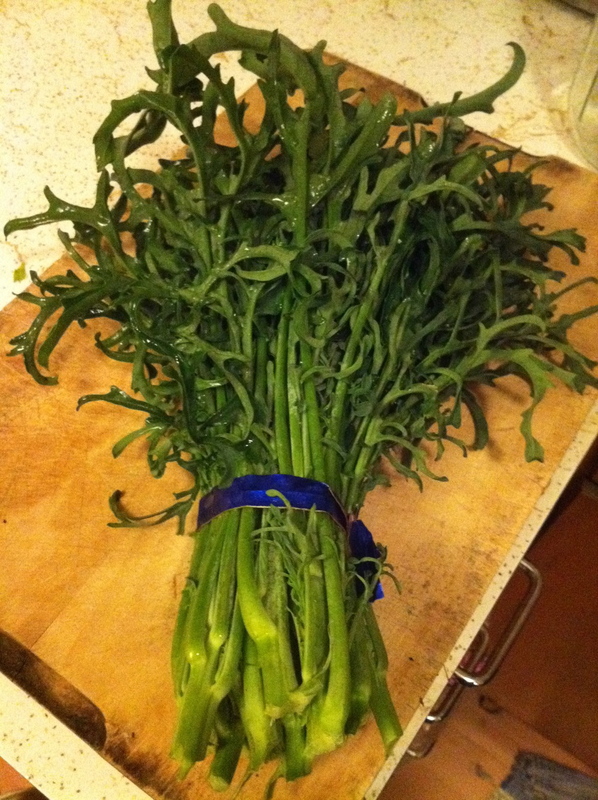 We first grew spigariello at the suggestion of our friend Justin, who had cooked with it in Italy. We didn’t know quite what to expect when we read the description: “many small broccoli tops that will resprout when cut.” It turned out to be a big, bushy plant that eventually formed a very small central flower head that looked a little like broccoli. When you pick the central flower, the plant begins to produce small side branches, which each have a tiny floret of their own. This growth habit allows us to harvest continuously from the same plants for many weeks, since the plants continue to make new shoots to replace the ones we pick. Botanical side note – this growth habit is typical of brassicas, and is also found in basil and other herbs. Plants produce flowers in order to reproduce, and when you pick their un-opened flowers, some plants are moved to continue to produce these flowering parts ad infinitum. From the plant’s perspective, these flowers are its only chance to reproduce and keep its genes in the gene pool. When we pick them, the plant somehow knows what has happened, and makes more. Pole beans and climbing peas have a similar trait – if you leave a few pods on the plant long enough for the seed inside to mature, the plant will slow its production of new pods. In the “mind” of the plant, it has successfully produced the seeds it needs to pass on its genes, and so has less of a motivation to make more new seed pods. OK, back to the weird Italian greens. 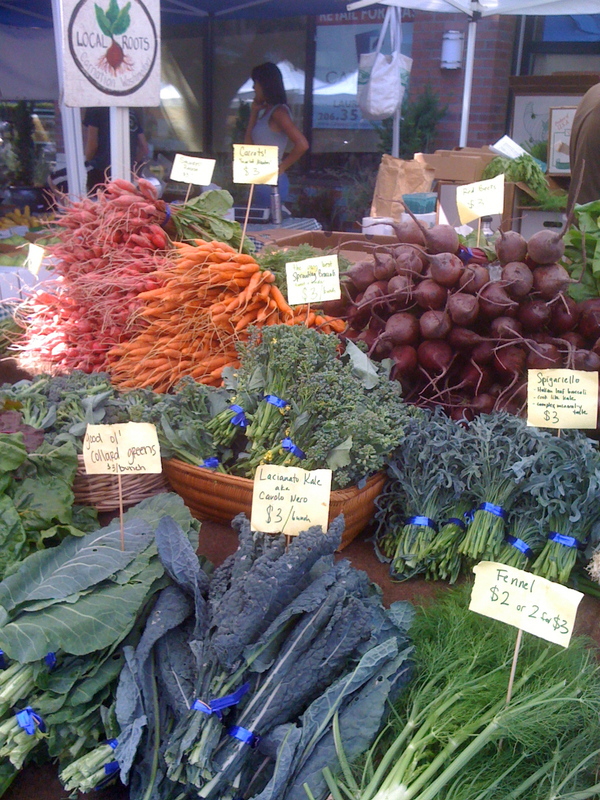 When we harvested our first crop, we cooked it a few different ways. In texture, the leaves of spigariello are similar to a hearty kale, like cavolo nero (aka Lacinato kale or the hated moniker “Dino” kale), but it also has tender, meaty stems (see picture above) that are probably the best part. The stems are a little like broccoli rabe, but less juicy, and a little like chinese broccoli, but less crisp. When we pick them off the plant, we break each flowering shoot at the point where it snaps off easily, which ensures that the whole sprig is tender enough for eating. The flavor is also most similar to kale, but more complex. It’s a little bitter and a little mineral-y, neither of which sounds particularly appealing, but for those of us who love strong flavored vegetables, spigariello has a taste that you can’t find in other greens. Cut the stemmy parts into small bits, reserving the leaves. Put the stems in a pan with some olive oil, crushed garlic, and maybe a little water. Cook until softened, turning up the heat a little if you want a little browning. When the stems have slightly softened, roughly chop the leaves and add them to the pan. Cook until done to your liking. In Italy, they might then toss the spigariello with sausage and some red chili flakes and perhaps then add it all to pasta. Come vuoi. The real reason I wanted to write about spigariello today is because I’m hoping to solve a botanical mystery. The internets tell me that spigariello is just a variety of broccoli, Brassica oleracea, Italica group. All the varieties of Brassica oleracea that I’m familiar with have yellow flowers, with the exception of Chinese cabbage (gai lan) which is in the Alboglabra group. The internets also tell me that the Alboglabra group originated in the Mediterranean. So, what I’m hoping someone will be able to tell me is whether spigariello is actually more closely related to gai lan than to other broccolis. Anyone, anyone? Also, given that these different varieties are all considered to be the same species, can Alboglabra cross breed with Italica? In my perusals of the internet in search of spigariello information, I have come across other interesting broccoli-like plants. For photos of some other Italian broccoli-like plants, check out “Amici dell’Orto.” The site is in Italian, but if you click around you can see photos of other Italian oddities, like red-veined arugula and lots of crazy melons and squash. However, every site I visited insisted that spigariello, despite its white flowers, is just a variety of broccoli. I don’t believe it’s true! In any case, I hope you’ll come to the market and try some spigariello for yourself. We’re in the midst of the great freeze of 2010 at the moment, but if we’re lucky, the hardy spigariello plants will survive to see another day. If not, you’ll have to wait until next spring. Your Spigariello looks almost like Rapini here on the east coast! Just ours isn’t as dark blue! How’s the flavor? Rapini tends towards somewhat bitter, like dandelion greens. How easy is spigariello to grow? Spigariello is distantly related to rapini, but much more closely related to broccoli and kale. It’s pretty easy to grow from spring to fall here in Western Washington (zone 7). We start our seeds in an unheated greenhouse as early as March, and set out 5-week old transplants throughout the season for a continuous harvest. I am so glad I stumbled upon your blog. Living in the Midwest and loving to grow the odd and fun, I purchased a packet of seeds from Gourmet Seed International and forgot to sow it last season. I’m excited to try this Brassica. I’m here because I just got home with a bunch of your spigariello. (Not for the first time, though.) In my opinion … I like your white flowers gai lan theory, but it just illustrates the entrenched nomenclature problems. Gai lan is “chinese cabbage”? Argh! I’ve seen “cavalo nero” (I think your spelling is right, though) that looked more like your spigariello than kale. You can find online comments about spigariello that make it look more like the turnip-y yellow flowered broccoli rabe. What we are growing is definitely spigariello. However, there seem to be a few different types. Johnny’s sells a flat leaf kind. I’d say one in ten of the seeds we use end up with the flat leaf, but most have that beautiful deeply serrated leaf. I’ve also seen pictures on Italian blogs of spigariello that seems to be grown more for a broccoli head than side shoots. Not sure whether any of those types have the white flower like ours does. It’s definitely a mysterious plant. the plant which you call spigariello is called in Europe “cicoria di catalogna” also “cicoria asparago” (see e.g. http://en.wikipedia.org/wiki/Puntarelle). You have a nice blog going. Nope. Spigariello is not a chicory. We grow puntarelle, along with many other chicories, and I can definitively say, Spigariello isn’t one. Chicories are in the Aster family, and have lovely cobalt blue flowers with many petals. Spigariello resembles a Brassica oleracea in every way except that it has white 4 petal flowers instead of yellow. When we saved seed from our Spig, we got very few out crosses with brassicas that were flowering at the same time. The question we want to answer is, what is the genus and species of spigariello. I am growing the other version of Spigariello, Spigariello Neapolitan ‘Friarielli” Brocoletti from Italian seeds . It is definitely brocolo making delicate loose branches with large flowered heads. No white flowers here and not a rapa. Delectable. Love Kai lan, haven’t grown anything else like it. I grew spigariello riccia this year, the one with the leaves like yours (not liscia with smooth leaves). Did not realize it’s a warm season or cool season crop. 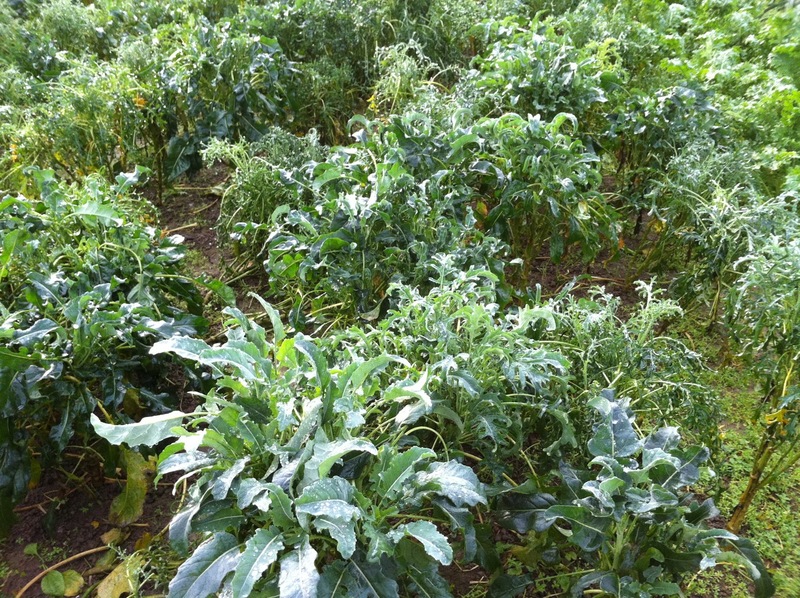 Not a cold season crop like kale. It did not like the 25F in the gardens… although the one in the hoophouse still doing OK. I use thebaby leaves in salad mix. Is this plant a perennial or annual?